personal expense manager. 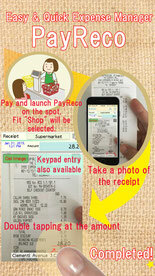 Taking a receipt photo, or inputting amount using keypad on the spot is only thing you should do! This simplicity makes you keep managing your spending. 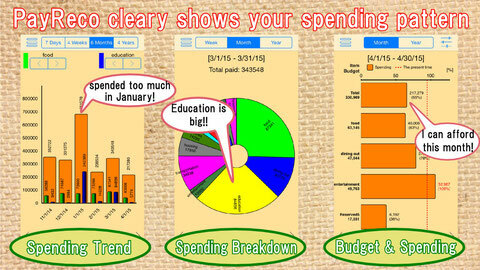 PayReco clearly shows your spending pattern with the simple records. ■All you have to is input the amount. The amount can be inputted by image recognition of a receipt photo or by hand. After taking the receipt photo and double tapping at the amount of the photo, the amount is inputted automatically. Keypad entry is also available. ■Inputing on the spot is a big key point. The PayReco remembers the purchase locations. Once you input a receipt and set the location as “Supermarket”, next time, PayReco finds out the shop is “Supermarket” based on the location automatically. So All you have to do is input the amount. This custom also helps you not to forget to enter the record. Please install PayReco on your family’s iPhones. Husband and wife can records their spending by PayReco respectively. 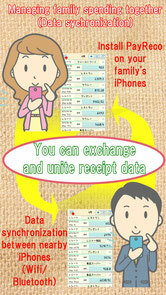 They can exchange and unite receipt data by Data synchronization function. The data exchange is made between nearby iPhones using Wifi/Bluetooth. Monthly Report can be seen as PDF file. You can also send the file by e-mail. Printed these files are very useful for analyzing in detail. Major shops like Supermarket, restaurant, clothes store and etc. are already stored in PayReco. Of course, you can add new Shops. The Shop can be linked to up to 2 account items. For example, the Supermarket links food expense (90%) and sundry (10%). The restaurant links dining out (100%). The ratio of the account items can be changed. If you spend money at the shop, the amount sums up each account items based on the ratio. PayMap is our product. If you are a user of the PayMap, you can import the data of the PayMap into PayReco. *PayMap can hold several photos for one receipt. But PayReco can hold one to one. So, one photo data for one receipt can be imported to PayReco. Free version of PayReco can manage up to 50 receipts. If you like this App, please purchase the upgrade function in Settings to deactivate this limitation. please enter the amount by hand.